I finished the Tweedy Vest last night. I love how it turned out. 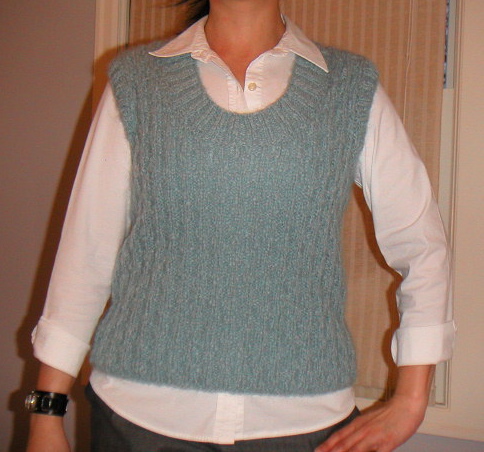 I especially like the wide neckline, which is only wide on the front half, that was worked with short rows. The only minor changes I made involved the short rows. The pattern calls for all these yarnovers after turning the rows. The directions were a little confusing, considering it was late and I just wanted to get the vest done so I could wear it today. I decided to forego the yarnovers and just work regular short rows and I think it turned out fine. I also steamed blocked the finished vest lightly at the seams and the neck.